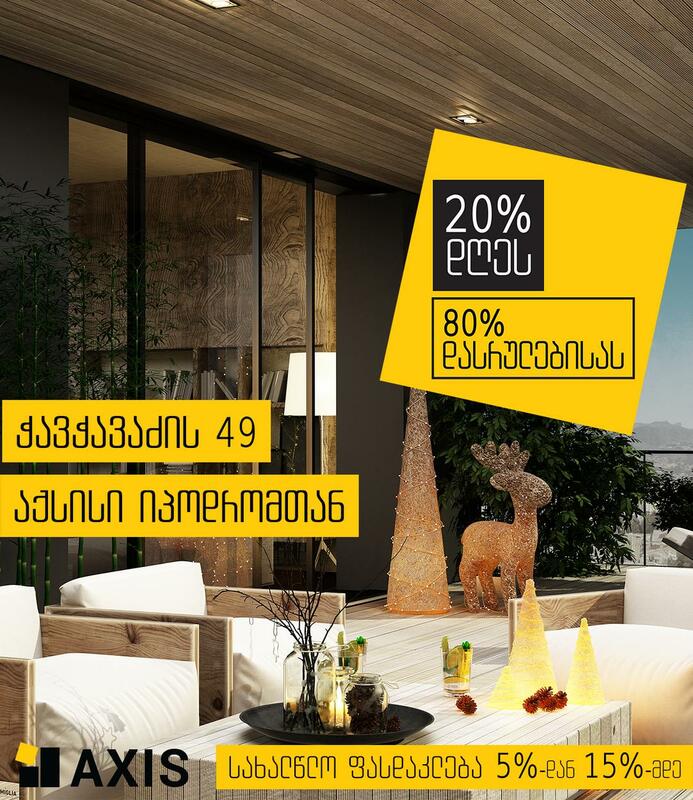 “Axis” development offers New Year promotion 20/80. Within the framework of the promotion you will pay only 20% of the cost of the apartment and the remaining 80%-upon completion of the construction. In connection with New Year Axis offers you discount from 5% to 15% in residential houses Chavchavadze 49 and Axis near Hippodrome. Residential complex “Chavchavadze 49” introduces new standards of life. It consists of four blocks, one of which-Block II is finished. The construction works of structure of Block IV are also completed and façade finishing is underway. The building will be insulated by means of Caparol warmth-keeping materials. For the insulation of the roof polystyrene-foam concrete will be used, which is an innovative method and increases energy efficiency of the project. Waterproofing of the roof will be made by means of ALCHIMICA waterproofing layer without connection by means of polyurethane membrane. The drainage system – by means of WAVIN noise absorber pipes. Internal partitions of apartments will be finished with Saint Gobain sound and thermal insulation materials. The façade will be covered with silicone façade stained-glass window, doors and windows and sliding system of Norwegian company SAPAGROUP. Two MITSUBISHI speed lifts equipped with group system will be installed in the project. The construction of the third block and preliminary sale of apartments have already started. The construction will be completed in summer of 2018. Project “Axis near Hippodrome” consists of 3 blocks. The construction of Block I was completed in 2013. Block II will be completed in spring of 2017. In active phase are the construction works of the frame of Block III which will be completed in March of 2017. The project will be put into service at the end of 2017. Project Chachavadze 49 and Axis Ipodromi are distinguished by large terraces. Apartments are with interior works. Axis pays great attention to parking and recreation zones. Both projects have underground parking lots and landscaped inner yards. The pavements are widened and good pedestrian paths are created. The goal of Axis is development of the environment, for which it creates products, introducing completely new standards and requirements in Georgia.